Robert Mizrachi Wins Event #41: $1,500 Six-Handed Dealer's Choice ($147,092)! 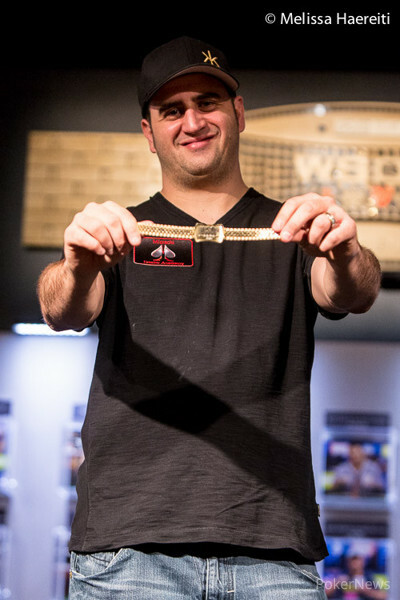 Robert Mizrachi began the day as the chip leader and just seven and a half hours later he was awarded his second career World Series of Poker bracelet. Mizrachi overcame a severe chip deficit and bested Aaron Schaff during heads up play to earn $147,092 in first-place prize money as well as the prestige of being the champion of the first-ever dealer's choice event. The day began with 10 players returning to the felt with hopes of claiming the aforementioned title. The day was filled with potential storylines including those of two-time bracelet winner Jen Harman and Melissa Burr. Not only were these two the last women standing in the event, but both were on the hunt for number three. For Harman, it was potentially a day to win her third bracelet. Burr, on the other hand, was looking for her third final table of the 2014 WSOP. Unfortunately for both ladies, these goals were dashed early on as they became the first casualties of the day with Harman busting in tenth and Burr falling in ninth. Soon after Burr's elimination, Arthur Morris was sent to the rail in eighth place, allowing the rest of the field to combine to the unofficial final table of seven. Marco Johnson came into the unofficial final table as the short stack and despite an early double up, he was ultimately unable to gain further momentum. Johnson was eventually eliminated by Mizrachi in 2-7 triple draw and the official final table was set. The final table had interesting shifts in dynamic with players slowly chipping away at each other's stacks in limit games one moment and suddenly changing pace by playing large pots for entire player's stacks in primarily pot-limit Omaha. The first large confrontation and eventual elimination did indeed come in PLO, and unfortunately for 2010 WSOP Player of the Year Frank Kassela, his quest for bracelet number three was cut short. During Kassela's final hand, four players committed 70,000 before the flop after it was potted by Daniel Idema. After the flop, Kassela found himself all in and at risk against Aaron Schaff with an inferior draw and hand. Kassela failed to improve on his hand on the turn or the river and he was eliminated from play in sixth place. Schaff, on the other hand, was sitting pretty with 68% of the chips in play five-handed. The next key hand saw not one, but two players hit the rail. Once again, Schaff was the executioner and his weapon of choice was pot-limit Omaha. Schaff, Idema, and Bill Chen took a flop together where a short-stacked Idema moved all in from the get-go. Schaff potted and Chen announced that he was all in as well. By the end of the hand, Schaff made top two pair which was good enough toeliminate both of his competitors. Schaff held a commanding lead and was suddenly two eliminations away from his first bracelet. Shane Abbott had been riding a short stack for a good portion of the day and had survived three all in confrontations up to this point. When the choice came around, he picked no-limit hold'em and this ultimately turned out to be an ill-timed decision. During a key hand, Mizrachi opened with a button raise and Abbott three-bet jammed from the small blind. Action folded back to Mizrachi and he snap-called. Mizrachi was in a dominating position with his pocket aces and his lead extended even further after the flop hit the felt. Just for good measure, Mizrachi drilled the fourth ace on the turn ( ), giving him quads and an insured victory. Abbott hit the rail in third and took home $58,414 in prize money. Despite his victory over Abbott, Mizrachi was still at a severe chip disadvantage against Schaff. That, however, did not stop the bracelet-winner from grinding his opponent in limit games to quickly increase his stack. 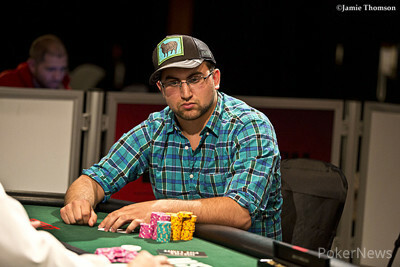 Mizrachi seized the chip lead not too long into the heads up bout and never relinquished it for the rest of the match. Schaff considered pot-limit Omaha to be his best game and was consistently picking that when the choice fell upon him. Mizrachi, on the other hand, mixed it up consistently with his most-picked game being Omaha 8. On the final hand of the match, Mizrachi had worn Schaff down to about 3.5 big bets in the draw games. Mizrachi had the game selection and chose A-5 triple draw. The two got it all in for Schaff's tournament life before the second draw. Mizrachi stood pat for the final two draws while his opponent opted for one card on each pull. To clinch the match, Mizrachi tabled his made and saw that Schaff's left him drawing dead. Mizrachi jumped up from the table and greeted his rail, which included his brother and three-time bracelet winner Michael Mizrachi. Schaff, on the other hand, was forced to settle for a runner-up finish and $90,854 in prize money. That does it for our coverage of the inaugural Dealer's Choice event! Gauging from player reactions and the constantly jovial tournament atmosphere, this event proved to be a huge success and will likely return in years to come. PokerNews extends its congratulations to Robert Mizrachi for overcoming the field and becoming the first-ever Dealer's Choice Champion! 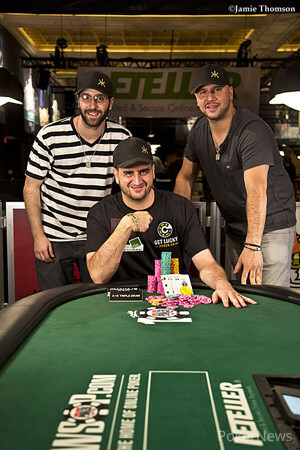 Robert Mizrachi selected A-5 triple draw. Aaron Schaff had the button and raised the action. Mizrachi quickly made it three bets to go and Schaff thought for a moment before moving out a call. Mizrachi pulled two new cards and Schaff opted for just one. Mizrachi checked the next street and Schaff led out with a bet. Mizrachi instantly announced a raise and Schaff three-bet the action. Mizrachi four-bet and Schaff called all in. Mizrachi stood pat on the second draw and Schaff pulled one. For the third draw, Mizrachi stood pat once more and Schaff pulled one final card. At that, the hands were tabled. Mizrachi confidently rolled over and Schaff tabled . "Drawing dead?!" said Mizrachi excitedly. Schaff was indeed drawing dead with his final card (which turned out to pair him up with the ). Mizrachi's rail then rushed the secondary feature stage, congratulating him on his second bracelet win. Schaff became the runner-up and took home $90,854 in prize money. Schaff tossed out 25,000, not enough for a raise, but Robert Mizrachi threw out a quick call and the dealer quickly spread a flop. Mizrachi and Schaff each checked, and a hit. Mizrachi bet out 35,000, and Schaff made the call. The river prompted 65,000 out of Mizrachi, and Schaff paused, cutting down his stack as he tanked. "What are the blinds?" Schaff said. Informed the big blind was 16,000, he continued: "Well, how can I make it 25?" The dealer said it should have been 32,000, but Schaff pointed out there was nothing that could be done now. Finally, he made the call, and Mizrachi showed for three deuces. 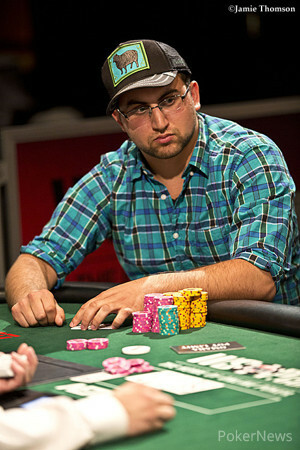 Aaron Schaff selected no-limit hold'em. Schaff moved all in from the button for his last 180,000. Robert Mizrachi called and the hands were turned on their backs. The dealer fanned a flop, keeping Schaff's better ace in the lead. The turn was the , giving Mizrachi outs to an inside straight as well as a pair, but it was ultimately not meant to be as the finished off the board. Schaff finished with the best hand and he doubled to 368,000 in chips. Mizrachi still holds a commanding lead with 1.517 million. The fight over very small pots continues, and Robert Mizrachi is simply winning more of them. In a recent hand, the players checked to the end in a PLO pot, Aaron Schaff's selection, and the board was . Mizrachi bet 14,000, and Schaff called. Mizrachi showed for a pair of jacks, and he took the pot. Players are taking a quick break rather than the scheduled 60-minute dinner break. After a few uneventful rounds and the first pot-limit hold'em pick of the day by Robert Mizrachi, Mizrachi has extended his lead. By chipping away with small pots, Mizrachi now holds about 1.45 million to Schaff's 435,000.